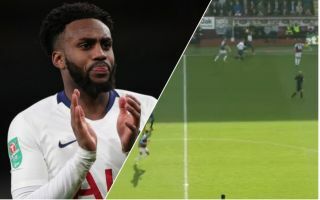 Danny Rose produced a genius piece of play for Spurs this afternoon as he assisted Harry Kane in the north London side’s 2-1 defeat to Burnley at Turf Moor. Mauricio Pochettino’s side lost 2-1 to Burnley this afternoon, a result that deals a big blow to any hopes the club had of staying in this season’s title race. Goals from Chris Wood and Ashley Barnes were enough to see the home side pick up all three points, with Kane being the only goal scorer for the away side. And it was Kane’s goal that had a lot of fans talking, but not about the England international’s fine finish, but the brilliant assist from Danny Rose in the build-up to the goal. Having won a throw in just inside Burnley’s half, Rose then launched the ball down the line to Kane, who found himself through on goal, as he cooly applied the finishing touch to draw the away side level. This smart piece of play from Rose saw him lauded by fans on Twitter, who were impressed with the defender’s quick thinking from the set-piece. You can check out what fans had to say on the matter down below. He may have stolen a few yards on the throw-in, but what a throw-in it was! Really a brilliant decision by Rose, caught them napping. Burnley defence gone to sleep there.. Brilliant thinking from Rose and Kane..
Danny Rose. Brilliant there. Quick throw in.